Open in Microsoft Edge extension opens the current tab or links in Microsoft's Edge browser. Using this extension you can send links to Microsoft Edge without the need to manually copy and paste links. 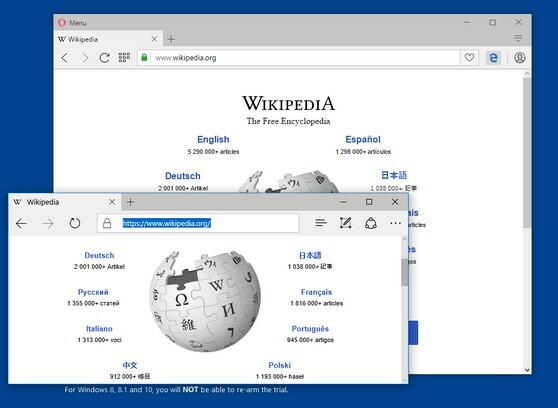 If an Microsoft Edge instance is already opened, then link is opened in a new browser tab, however, if Microsoft Edge is not opened, a new Microsoft Edge window is opened. For this extension to open links in Microsoft Edge browser you will need to install a minimal native client. The instruction to install the native client is displayed once a link opening is requested. Edge is a trademark of Microsoft Inc., registered in the U.S. and other countries. This extension is an independent project and has no relationship to Edge team or Microsoft Inc.